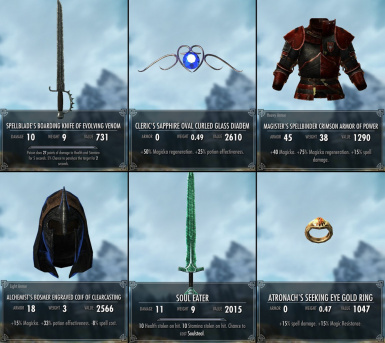 This is a selection of patches for 3jiou's "Xtended Loot" that will enable it to enchant and distribute items from other mods. 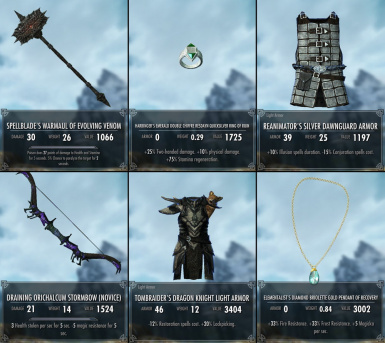 First of all you obviously need Xtended Loot by 3jiou, which in turn requires the Dawnguard and Dragonborn DLCs. When you load up the game after installing the add-ons you'll find this page in the Xtended Loot MCM, which shows all of your installed plugins. The items in the add-ons are automatically sorted via scripting, and while this is happening the add-on will be shown as "REGISTERING" in the menu. The registering process can take a long time if there are many items in a plugin, so just be patient - you can carry on playing while it sorts in the background. When the add-on is fully registered the text will switch to "OK". To make the most of these add-ons you need to enable the "Use mod items" option in the Settings menu (shown below, bottom right corner of the menu). Without this option enabled Xtended Loot will apply enchantments to the items enemies already receive through leveled lists, and the add-on items will only be found in chests and sold by vendors. 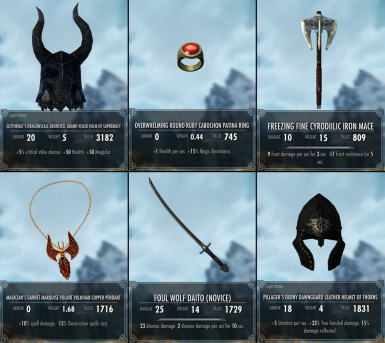 If enabled, the items in the add-ons are distributed to enemies, so the loot is more random and you'll also find mod items that haven't been added to leveled lists. Once you've installed an add-on you shouldn't remove it during that saved game. 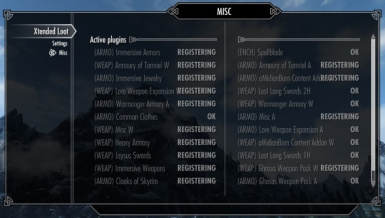 The add-ons can be merged using matortheeternal's TES5Edit Merge Plugins Script, but this must be done before the add-ons have been present in your saved game, or bad things may happen. You then should not remove anything from your merged esp, although you can add more add-ons to it later if you can preserve the FormID's of the already merged items. This patch will enable Xtended Loot to use some of Spellblade's weapon enchantments. 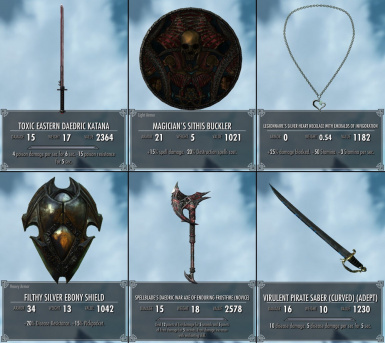 Weapons enchanted with Spellblade effects will follow the naming convention "Spellblade's <item name> of <enchantment name>" so that you'll be able to easily identify them for use with Spellblade's auras, and to look up the hidden enchantment bonuses in the Arcane Workshop's book collection. You'll see some examples in the images. 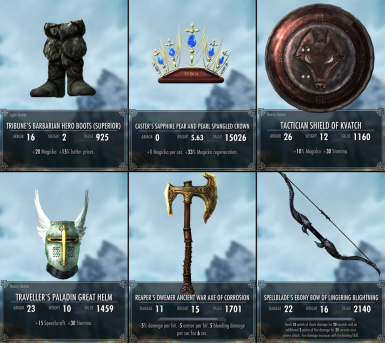 For use with the optional "Content Addon" for Book Of Silence, which adds multiple variants of some armor sets. For the "All in One BDYEB with Single ESP" version. 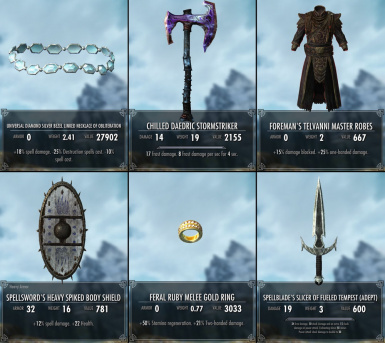 Requires the "Heavy Armory - CCO Supported Version" file from the Complete Crafting Overhaul Remade mod page, under miscellaneous files. You don't need CCOR, it's just an esp that merges the DLC parts into the main file. 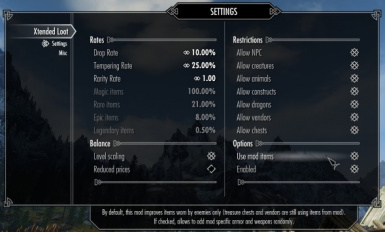 You need to install the version from the original mod page (Dragonborn version plus Dawnguard Addon) then disable the two esp files included and replace them with the single merged esp from CCOR. 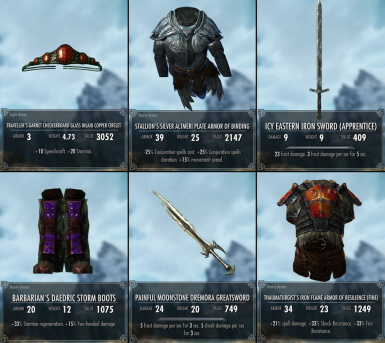 Includes all armor sets and variants. 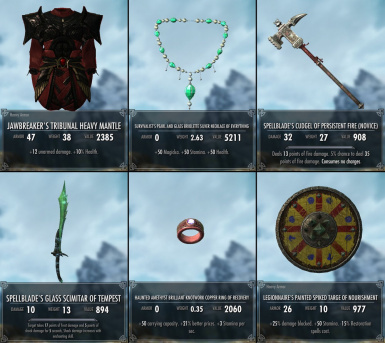 Wherever a set can be heavy, light or unarmored such as the Ebony Mage or Tribunal Robes set, there's a chance to find it as any of those. 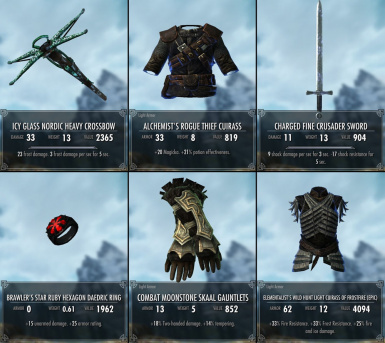 Please note that the patch has nothing to do with Immersive Armors' MCM menu, so if you turn off the distribution of a particular set in there you could still find it from Xtended Loot. Rings are right hand only, your left hand isn't strong enough to withstand the powerful enchantments added by Xtended Loot. There's also an alternate patch for users of Complete Crafting Overhaul Remade, which already has the mod integrated. Remember to install JaySuS' models and textures too, as per the CCOR instructions. 1-handed and 2-handed versions available, depending on which version of the mod you're running - only install one. 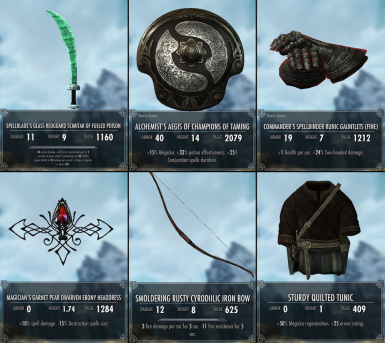 I made the add-on from the Redux mod, although if you only want to use the original Unique Bows Collection mod the add-on will still work, although the weapon stats will match those of the Redux.